Click Links above for yacht crew job descriptions and info. Captain needed for locally based vessel located in Palm Beach that cruises S.FL and Bahamas. Must have own accommodations and transportation for non-live aboard boat, can oversee vessel upkeep+schedules and maintain vessel with stew as needed. Capt/Eng (single) or team with Cook/Stew considered for permanent position on vessel in FL leaving for Nantucket for Summer. 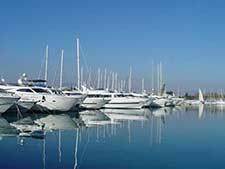 Capt/Eng must have fishing skills+mechanical skills & drive 45 cabo tender. Must like dogs. Boat upgrades to 90' by year end. Chief Steward(ess)/Purser needed for temp position with possibility for permanent job on vessel cruising Mexico for Winter to Spring. Job requires maintaining interior, seeing to 2-8 guests, managing ships paperwork and reporting directly to Owner. Cook/Stew needed to start March 8th in Bahamas for private trip. Must be able to cook for guests/owners and crew of 3 and maintain interior. If trip works out well Chef/Stew may be hired full time to go to Mediterranean. STCW req. Cook/Stew (single) or team with Capt/Eng considered for permanent position on vessel in FL leaving for Nantucket for Summer. Cook/Stew must cook family style meals, clean interior/exterior & organize. Must like dogs. Boat upgrades to 90' by year end. Deck or Deck/Stew needed to work permanent position aboard classic sailing yacht located in Great Lakes for the Summer. Prefers someone in the Great Lakes area with previous sailing experience but will accept novice if willing to be trained. Deck/Cook position available for vessel cruising Bahamas & South FL. Must be able to cook for crew of 4, handle lines+fenders and maintain exterior, have STCW and ENG1 certificates. Previous yacht experience required. 1st Officer/Mate needed for permanent job aboard local boat that travels S.FL and Bahamas. Position is non-live aboard since owners live onboard for 6 months. 1st Officer/Mate must have 200t USCG lic, fishing+diving skills and drive tender. STCW req. Chief Stew needed for permanent job aboard local boat that travels S.FL and Bahamas. Position is non-live aboard since owners live onboard for 6 months. Chief Stew must provide casual, family style services and maintain interior. STCW req. Stew/Cook needed for permanent job on vessel cruising Summer in N.E. Must be able to cook for crew, make appetizers, clean interior+assist on exterior as team player & help with lines+fenders. Must have good, agreeable attitude+previous experience. Team of Capt/Eng+Cook/Stew or 2 individuals needed for permanent position on vessel in FL leaving for Nantucket for Summer. Capt/Eng must have fishing skills. Cook/Stew must cook family style meals. Must like dogs. Boat upgrades to 90' by year end. Captain+Cook/Stew Team needed for permanent position on vessel based up North for Summer and FL for Winter. Both must have an eye for details+be able to maintain vessel. Cook/Stew must cook family style meals. Boat is non-live aboard both N. & S.
Captain+Cook/Stew Team as two person crew needed for permanent position on vessel that is traveling Western US Coast and Mexico. Cook must be able to cook modified Kosher meals, handle lines, stand watch+maintain interior. STCW required for both. 1st Officer/Mate+Chief Stew Team or individuals considered for permanent job aboard local boat that travels S.FL and Bahamas. Position is non-live aboard since owners live onboard for 6 months. Both must supply casual, family style service. STCW Req. Thank you for visting Crewfinders International, Inc. Copyright Crewfinders International, Inc. All Rights Reserved.